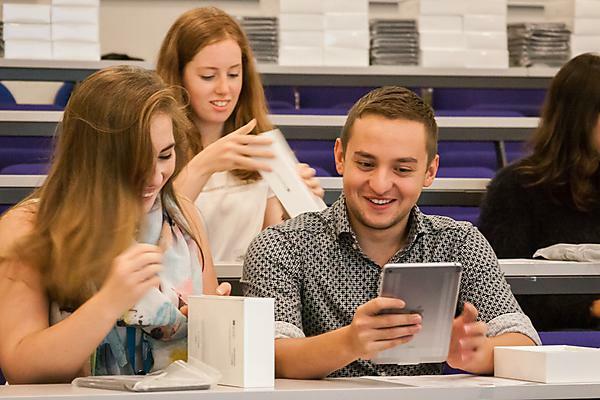 Medical students now have enhanced assessment and learning experience thanks to the introduction of 240 new iPads. Medical students at the University of Plymouth have enhanced assessment and learning experience thanks to the introduction of 240 new iPads. Students in years three to five of their medical degree – the most clinically focused – at Plymouth University Peninsula Schools of Medicine and Dentistry (PUPSMD) will be able to use the tablets for all aspects of their learning, from referencing eBooks, study guides to submitting assessments. As part of the PULsE (Peninsula Ubiquitous Learning Enhancement) project, the initiative aims to provide unified and ubiquitous learning experience for students and faculty, with the iPad selected as a preferred device to deliver this ambition because of its security, ease-of-use and support, and the availability of apps that can enhance the curriculum and the learning experience. The iPads, which will be initially issued to third-year students on a 1:1 basis as well as based in the University’s Life Science Resource Centre (LSRC) and Clinical Skills Labs, also cut out an estimated 60 per cent of red tape costs as there is no need for manual handling in any of the assessment process. The iPads are being introduced to replace paper-based communication and assessment methods, as well as enable and empower students to learn with access to all materials in any location at any time of day. The iPads are equipped with Office 365 plus a multitude of apps, and hospital locations such as Derriford in Plymouth have also been tuned into the University WiFi network, making it easier than ever for students on clinical placements to supplement their practice with recording, learning and reflecting at a time to suit them. “It’s absolutely great to be offering enhanced personalised learning for our students through the PULsE project. The project is a timely response based on National Information Board and NHS England’s ambitions to make mobile digital technology an integral part of future patient care. The project will not only enhance the assessment and feedback process but provide for point-of-care clinical reference, while substantially reducing the faculty’s carbon footprint." “We’re continually working to improve our medical curriculum through research and scholarship, and the addition of iPads to our clinical care and practice years provide added value to the education experience. We are providing iPads rather than using a ‘bring your own’ device policy to ensure that we remain committed to our widening participation strategy." Our students learn vital clinical and communication skills in the safe, supported environment of our Clinical Skills Resource Centre before they begin work in a real clinical setting. You'll further your understanding of anatomy and how the human body works through a wide range of specialist expert-facilitated sessions and resources including ultrasound and magnetic resonance imaging. You'll benefit from early clinical contact and a wide variety of high quality supervised clinical placements in multiple settings including community care, primary care, general secondary care and specialist & tertiary care. This means that you'll learn from real patients from the outset, with clinical placements right from the start.